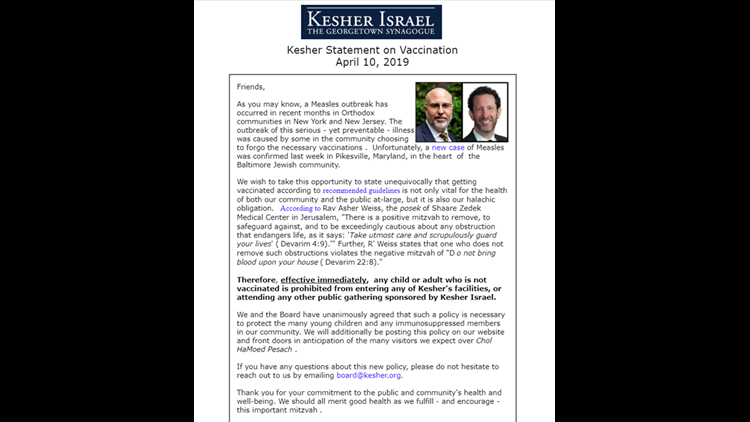 WASHINGTON — Kesher Israel, an Orthodox Jewish synagogue in Georgetown, is saying it will not allow any child or adult who has not had their measles vaccine to join any services at Kesher. "Getting vaccinated according to recommended guidelines is not only vital for the health of both our community and the public-at-large, but it is also our halachic obligation," wrote Rabbi Hyim Shafner. The synagogue's move comes as New York City's Orthodox community grapples with close to 300 cases of measles. At least two religious leaders in Brooklyn have cautioned their congregants against getting the vaccine, leading Mayor Bill de Blasio to declare a public health emergency requiring everyone in Williamsburg to get the vaccine within 48 hours. "It's so against what we believe as Jews, it's just -- it's a little heartbreaking," said Shafner, adding the Torah dictates, "you're not allowed to endanger yourself. You're not allowed to endanger others." 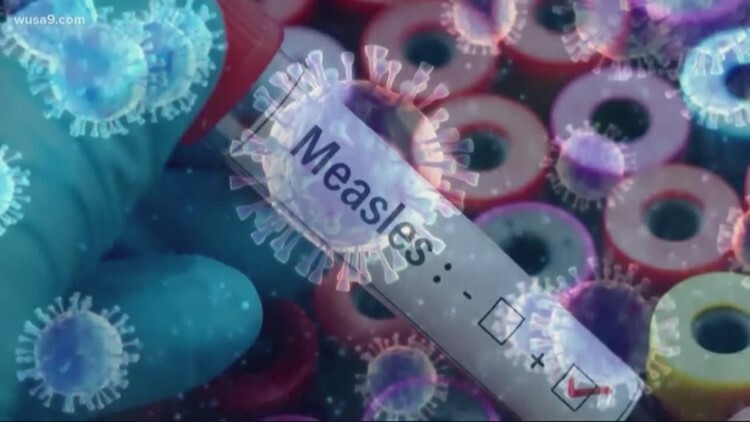 The first confirmed case of measles in Maryland was reported last Tuesday in Pikesville, a popular Orthodox Jewish area. Shafner told WUSA9 he and his congregants are worried unvaccinated people traveling to D.C. over the upcoming Passover holiday could be bringing measles with them. "It really began because somebody in the congregation came to us and said 'Hey, this is happening in other places, I have a little kid, I'm worried about my own children," said Shafner. The synagogue will not be able to check who has gotten their vaccines, but the rabbi trusts congregants will respect his wishes. "We can't really check, so what we can do is put up signs," he said, adding he felt an obligation to get involved. "As a rabbi, I want to make a statement, because I feel something is being done against Judaism, telling people not to vaccinate is against Jewish law," he said. The letter sent to the Kesher Israel congregation. Kemp Mill Synagogue and Young Israel Shomrai Emunah, both Orthodox synagogues in Silver Spring, have also taken a stance and adopted their own vaccination policies. "The issue of the spread of measles throughout communities around the world and in our own country has raised health concerns for numerous members of our community, of all ages," a weekly bulletin at Young Israel Shomrai Emunah said. "Effective immediately, YISE policy requires all children on the shul premises or attending a shul program to be in full compliance with the vaccination recommendations of the State of Maryland. If your child or your guest's child is not in compliance, please do not bring him/her to our shul or programs." Synagogues are hoping they can spread the word on Facebook and social media before Friday night services. Jewish leaders in Baltimore are going above PSAs and working in coordination with the Baltimore City Health Department to offer free MMR vaccines for adults at Congregation Shomrei Emunah in Pikesville. Immunizations are being offered from 10 a.m.-5 p.m., on Friday, April 12. FREE MEASLES VACCINATION CLINIC: The Baltimore City Health Department will be hosting a vaccination clinic tomorrow in Northwest Baltimore at Congregation Shomrei Emunah. "In partnership with Sinai Hospital/LifeBridge Health, and Rabbinic leaders in the community, we are holding today’s clinic to focus on providing measles vaccine to adults who have received 0-1 dose of MMR vaccine and who plan to travel to areas with measles outbreaks or who will have contact with visitors from those areas and who are not able to receive vaccine at their primary care provider or pharmacy," Mona Rock, a spokesperson for the Baltimore City Health Department said.